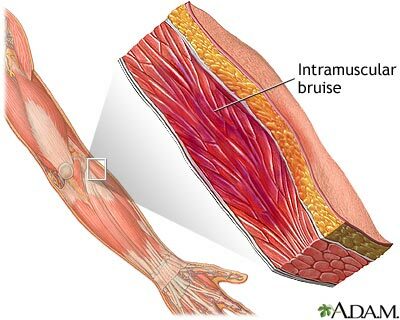 A muscle bruise occurs when a direct blow from an object strikes part of the body, damaging the underlying muscle fibers and connective tissue without breaking the skin. A muscle bruise can cause pain and swelling and limited range of motion of the joint near the injury. Depending upon the extent of injury, a muscle bruise can take days or months to heal.